LAHORE -- Thousands of demonstrators took part in a rally Sunday (April 22) in Lahore calling for an independent judicial system and an end to extrajudicial killings in Khyber Pakhtunkhwa (KP) and the Federally Administered Tribal Areas (FATA). The rally at Mochi Gate was organised by the Pashtun Tahafuz Movement (PTM), which is led by Manzoor Pashteen. His group has been protesting since January after the killing of 27-year old Naqeebullah Mehsud during a Pakistani police raid in Karachi, Radio Free Europe/Radio Liberty (RFE/RL) reported. Authorities have maintained that Mehsud was a member of Tehreek-e-Taliban Pakistan (TTP), a claim disputed by his relatives in South Waziristan. Pashteen demanded that the government form a Truth and Reconciliation Commission to investigate disappearances and extrajudicial killings. "Thousands of Pashtuns were killed and were [detained without due process]," Pashteen said at the rally. "We are not demanding the release of all missing persons but demand they they are produced before a court of justice and let the courts administer justice if they committed a crime," he said. "We want justice for all who were killed without prosecution and for the people who were forcibly disappeared," Pashteen said. The PTM is also seeking justice for those killed in the December 2014 TTP massacre at the Army Public School (APS) in Peshawar. Former TTP spokesman Liaquat Ali, alias Ehsanullah Ehsan, surrendered to Pakistani authorities in April 2016, but parents of almost 150 children who died in the APS attack are demanding a military trial for Ehsan. Pashteen said that his movement will continue to protest until it has obtained justice. He announced plans for a gathering in Swat on April 29 and another scheduled in Karachi on May 12, the anniversary of deadly riots there in 2007. The government has rejected allegations that it is responsible for forced disappearances. Maj. Gen. Asif Ghafoor, director-general of Inter Services Public Relations (ISPR), said during a news conference March 28 that most of the genuine demands of the Pashtun movement have already been addressed by the government. Pashteen was joined in Lahore by Pakistanis from all walks of life, including human rights activist Hina Jilani, Defence of Human Rights Pakistan chairwoman Amina Masood Janjua and peace activist Farooq Tariq. Other speakers included Fazal Khan, chairman of the committee of the parents of students killed in the APS attack; Tahera Jalib, daughter of revolutionary poet Habib Jalib; and Fanoos Gujjar, president of the Awami Workers Party. They, along with thousands of others, gathered despite a ban on the rally and a media blackout. "It was an amazing showing by the PTM in Lahore even though the district administration didn't allow it to hold the demonstration," Shakeel Khattak, a Lahore-based TV journalist, told Pakistan Forward. A large number of local residents, including women, joined Pashtuns from Lahore and other nearby cities at the rally, he said. "Although the majority of local media had blacked out coverage [of the rally], about 5,000-10,000 people gathered at Mochi Gate, which was unexpected," Khattak said. An AFP reporter at the scene estimated about 5,000 people attended the rally -- smaller than recent protests, but a significant showing considering Lahore lies far from the movement's base in northwest Pakistan. The relatives of missing persons attended the rally in force, many of them bringing the portraits of their lost loved ones. Aminullah, a resident of North Waziristan, said his 15-year-old brother went missing in January 2016. "Nazim was a 10th-grade student when he was picked up from the Indus Highway," Aminullah told Pakistan Forward. Nazim's whereabouts are still unknown. Abdul Mateen, another participant, said his brother Jalal and cousin Kashifullah went missing in 2014 and 2017, respectively. "My nephew Muhammad Usman was kidnapped from Ravi Square in Lahore," another demonstrator, Shamoon Khan, told Pakistan Forward. "Pashteen started his struggle when Naqeebullah, a youth from Waziristan, was killed by police in Karachi," Riffat Ullah Orakzai, a Peshawar-based senior journalist, told Pakistan Forward. "Pashteen has organised large marches in Islamabad, KP and Balochistan." "The PTM has become a ray of hope for the families of missing persons," he said. "That is why they follow Pashteen everywhere in the country." You have written a very beautiful article. 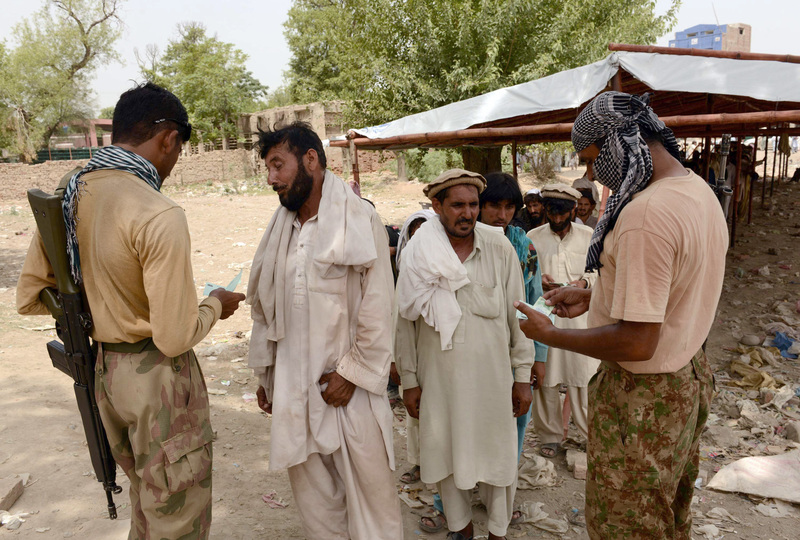 Local residents have welcomed the army's pledge, which is seen as part of the government's strategy to address recent protests from the Pashtun Tahafuz Movement.